Sales results – 3 strikes you’re out! Right, follow up. This is a sales tip about something that we as salespeople fail to do more often than not. Statistics tell us that 80% of sales are made between 5 and 12 contacts, yet only 10% of salespeople follow up after more than 3 contacts. So if it’s that obvious, why don’t we follow up? It may be to do with not wanting to be pushy or ‘salesy’, it might be because we’re busy, or maybe we’re just plain lazy. Or perhaps we don’t know how. Whatever, follow up activity is something that high performing salespeople do on a disciplined and regular basis. So what’s the best way to follow up? Sales is all about building relationships based on openness, trust and honesty, so whatever we do it should be with these things in mind. Follow through on every commitment you make, no matter how small or seemingly insignificant. Do what you say you will do. Research your prospects. Connect on LinkedIn / Twitter. Individuals and companies. Look at their website, Twitter feeds, Facebook and LinkedIn. Google them to see if anything else is being said about them. Read local publications and try to glean say 3 pieces of news, research or insight about the prospects you’re looking to work with or the region you’re working in. Subtly work that knowledge into your meetings. Look for any small favours you can do for them. Invite them to a networking event. Email within 24 hours after appointment / phone call. Summarise your meeting. Phone call at regular intervals. Seek further meetings / contact opportunities. Find other ways to keep up to date with their situation. Share blogs / articles and the like. Pop in for a coffee when passing. Attend Company Team / Sales / other meetings. Meet the Directors / other senior people. As ever, the key is planned, strategic activity. Remember that most sales are made between 5 and 12 contacts. Be innovative and creative and keep in touch! Sales quiz – could you be making more money? 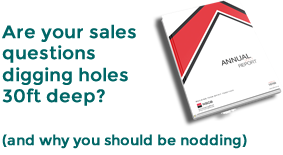 Sign up for monthly sales tips PLUS get your FREE ebook ‘Are your sales questions digging 30ft deep holes? How should we behave at networking events? Would you like to achieve results like these? Heroes Drinks Company – Just Getting Started.